Finally, after some stalls, delays, and other production problems, the sequel to ‘Dumb and Dumber‘ is definitely in production as we speak. It’s almost been 20 years since the first film that starred a young Jim Carrey and Jeff Daniels. Sure, they tried to make a prequel several years ago where Harry and Lloyd met in High School, which was a terrible film, but nothing since then. 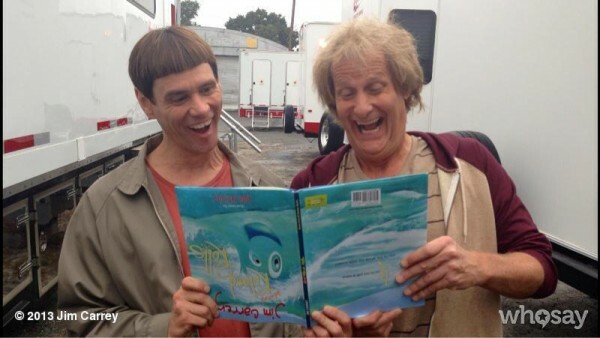 Carrey posted to his WhoSay profile and Twitter page a shot of him and Daniels as Harry and Lloyd in costume and character. Man, I can’t wait to see this. Peter and Bobby Farrelly are back on board as directors too with Laurie Holden from ‘The Walking Dead‘ as the female lead this time around. The film will take place 18 years after the first movie. This is going to be nothing short of amazing and hilarious. Now we just need Carrey to do another ‘Ace Ventura‘ movie and all will be right with the world. This entry was posted on Tuesday, September 24th, 2013 at 10:19 am	and is filed under Film, News. You can follow any responses to this entry through the RSS 2.0 feed. You can skip to the end and leave a response. Pinging is currently not allowed. « ‘Genre Talk’ on Sports Movies!!! Forget everything you've seen on television and in the movies.